Replete with images of ducks waddling in the street, itinerant fiddlers, and kerchief-clad worshiping women, we left the village of Szaszavas (Ceuas in Romanian) and made our way back to the city of Marosvasarhely (Targu Mures). 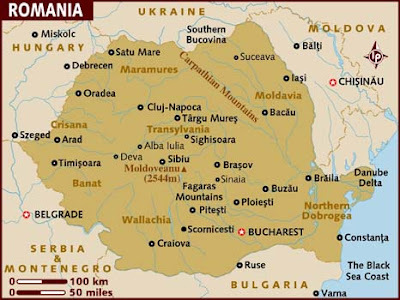 You can find Targu Mures on the map and using the scale of miles, go southwest about 18 miles. That’s about where you will find Szascsavas. On the east side of the map you will find the Danube Delta, site of a notorious prison camp. "The construction between the Danube and the Black Sea represented a economical solution for covering the murders of Romanian elites; communists saw this goal as a political way of getting rid of those that could mean a threat to the regime. . . ."
"Sent to the channel as “enemies of the state”, all prisoners were put through an extermination regime...sent in from different jails in distant parts of Romania, hungry and weak, they were obliged to work even harder. A doctor remembers digging endlessly in rain, storm or snow, returning from work soaking wet and frozen stiff, thronged in a single room. On the next day, they would be sent to work in the same frozen and wet clothes - temperatures were extremely low, especially in the winter time." On three sides water and on the fourth blood. By the time we arrived in Marosvasarhely, about mid-afternoon, the heat was again oppressive, and I was feeling the effects of burning the midnight oil to revise our interview approach. We settled on the following questions as a framework for the coming interviews. What happened to you – what was life like for you under Communism? Tell us about the things that helped you survive? How did Communism affect the church? What helped the church survive? What did the Psalms mean for the church? What can the church today learn from your experiences? What is the heart of the Reformed heritage? Our afternoon visit would put the revised protocol to the test. When we reached his home, Rev. Dezso Bustya graciously welcomed us, sweaty and frazzled though we were. While part of our team was engaged in perfunctory introductions outside, the crew set up inside and were soon ready to begin. At that point, Sonja and I retreated to the van, the shade, and bottled bubbly water. Rev. Bustya had been imprisoned by communist authorities while still a teenager and had spent time at the Duna Delta. He explained that pastors, on one hand, signed the official papers required by the state in order to be able to hold a church office – but at the same time were able to retain their integrity as Christians. My Hungarian colleagues used to say that within the minister training there is preparation for the first exam, for the second exam, and the third training is for prison. I always used to say that I got the third training out of order because I was in prison after my high school graduation and before my seminary training. I applied to the university to study literature, but I was arrested in the midst of the entrance exam. There was a joke later that the communist government chose the education for those not accepted to university. For me there were openings in geology not theology. I became a geologist at the Duna Delta; I shoveled the geo, the earth, at the delta. There are different ways to look at the reasons for my arrest. In today’s eyes I would say it was for foolish ways 16 or 17 year olds wanted to change the world. The name of our organization was IKESZ, an illegal organization against communism. One members was Zoltan Veres who now lives in Stockholm and is an official in the Lutheran church there. Others were Adam Bodor, a famous writer and Palocsai Zsiga, a poet. Thanks to his father, we were able to get out of prison before our sentence was completed. Palocsai’s father was a miniaturist gardener. Each year he would get a medal to wear on his chest. In 1952 we were arrested, and in 1953 he received another award. He told the party that he didn’t want another award or medal. He wanted his son back. They asked where his son was. He answered that his son was in prison in Szamoszujvar (Gherla). The party official agreed to look into the matter. He came back saying that not only his son, but eighteen had been arrested along with his son. In 1953 another sixteen students had been arrested, so there were thirty-five of our group all together in prison. The official said that they could not release one and keep the others in prison. After this, the parliament created a general amnesty setting us free, but we were warned. If anyone ever tried to recruit us again, we should know where to report them. They even tried to turn us into informers there. 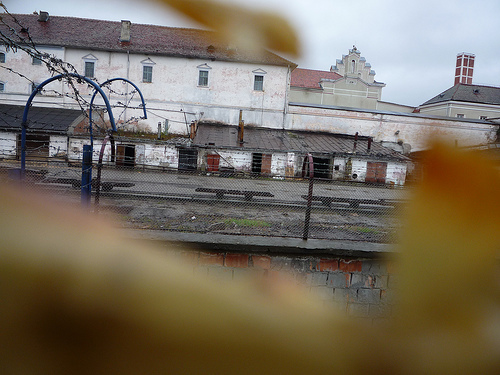 Eventually they transferred us from an underground prison in Bucharest to a prison in Kolozsvar (Cluj Napoca) and released us from there. Our organization was a real revolutionary group with our naïve ideas. This was painful for the party because they thought they would be able to raise a new generation that would cry for happiness when they received their communist young pioneer tie. We were older and able to think for ourselves, listen to foreign radio, and keep our eyes wide open. We saw how hypocritical the system was and how they tried to mislead children from the age of kindergarten. They were disappointed in our generation, the one they had hoped would be the next communists. I entered the seminary in 1955. On my books and class list I only wrote my name and the Roman numeral I, because I did not know whether there would be a second year. The world was supposed to change. All of us were waiting for Americans to come and free us. They never came in 1956 or ever after. Finally the second year came, but it was not until my third year that I began to love the seminary. In every person’s life God uses some people or events as his tools. He does not always scream down the chimney at you. In my life the tool was Andras Nagy, a professor of Old Testament. He took me seriously already before I did. He always said to me, Young man, you should do this or that. So along with Hebrew I began to study Arabic. When I finished seminary, I applied for acceptance in a master’s program, and that’s when I felt and said, “My Lord, even if you gave me a hundred options, I would still choose your service.” Really his influence was a determining factor. I was ordained in 1962, three years after I finished the seminary. Many people say that here in Marosvasarhely there are many believers whose faith originated in the Bethania movement or in the CE. Many of them accept as believers only those who can answer the question about when they became a Christian by identifying the exact moment by the year, month, day, and hour. I could not tell the hour when I became a Christian. God has different methods and tools for each person. Paul converted in the length of a second, but when was Peter converted? And how many times was he converted? Peter said, “Go away because I am a sinner, my Lord,” and to hear, “Get thee behind me, Satan.” So Luther is right. A Christian person’s life is an ongoing confession. Every day and every night one is ashamed – God I really want to be a Christ follower today, but again I failed. Please give me strength and maybe tomorrow it will go better. This was the story of my faith. Whoever the Communists wanted to recruit, they had recruited already at the seminary. Even more, forward thinking party officials insured that of the five or seven people admitted to seminary from a certain region, some were already ensnared. Those were not called by God to enter the seminary but by the party. They wanted to hold the church and all the ministers on a leash. To recruit seminary students, the Communists knew that everyone has an Achilles heel, as every jar must have a handle. One might like alcohol and get into a fight. The police might threaten him with a half year’s prison sentence but if he agreed to sign a cooperation agreement, it would be viewed as a foolish mistake. So he would sign the agreement and be in their clutches. Sometimes the Communist authorities simply picked someone out though there was no reason. I was told that no one, not even Laszlo Tokes, escaped the pressure to sign. Later, one’s ethical stance and common humanity determined who and what he would report. You could do this in different ways. It’s like when in a war someone is forced to go and fight but doesn’t necessarily have to kill. You can shoot in the air or put a hole in a leaf. Some only reported things that did no damage. Some of them warned others that questions were being asked about them. Many emmigrated to Hungary, not because it was wealthier or there was Hungarian TV or it was better there with nicer jobs. They left because they would have been forced, for example, to report on the bishop, Kalman Csiha, and their conscience could not bear it. Others threw themselves in front of a moving car, and while we never knew the reason, some of us suspected that they simply could not bear the pressure. I don’t know what it was like in Hungary, but here the party wanted to transform the whole country into a network of informers. It was a horrible thing. A condition of using a passport was that when you returned home from abroad, you had to give a detailed report to your supervisor who gave it to the officer responsible for church affairs, a man who cooperated with the securitate. So everything went before the bureau of internal affairs. You could get around it though, if you had a sense of humor and were clever. They wanted to know whether you had met any foreigners who spoke English, German, or Dutch, and what you had talked about. Instead of answering, you could write about the movie theaters you had visited and the films you saw. You could give a long and detailed description of the plot. You could report that you visited your wife’s cousin and then describe the visit in boring detail. This was the report you handed in. Of course they came back saying they were not interested in these details. They really wanted to recruit you as a spy. These were hard times, but with God’s help we survived. Bustya was still a teenager when arrested, and his time at the Duna Delta must have shaped his actions and responses over the next decades of Romanian terror and repression. His thoughts on pastors’ strategies for survival alerted me to the theme that would surface in nearly every interview – the effect of Communism on the church. When Rev. Bustya talked about the Genevan Psalms, he showed the record books of his service. He noted every text, every psalm, and the content of every sermon. For him and his congregation, I’m sure that the psalms they could sing were the ones that reflected their fear and grief. And like many others we would later meet, for him, the Genevan Psalter reflected his heart, his fear and his faith. He was ordained in the early 1960s, during my formative years. The students there lived under a cloud of fear. We lived in a bubble. Quoted from the transcript of Anna Paskandi’s 2004 film, Transylvania 1956, published November 8, 2011, in the Hungarian Review. When a Hungarian refers to another Hungarian, the family name is first and then the given name. So if I were Hungarian, I’d introduce myself as Lantinga Beth. Of course I’d never do that because I’m quite sure that true Hungarians would view it as gauche and pretentious. I recently learned that the same practice applies in Korea. I wonder whether it reflects a different cultural view of community vs. the individual. Ten years ago and maybe still today, a baby’s name was chosen from a limited list of approved names. So it is common to find several Hungarians with the same given name – hence two people in this post have the given name Dezso.